One of the key concepts underpinning my interpretation will be that of ‘community’. The intention is to establish a fictional community of Lincoln crafts folk and Guild members, all of whom will be individually identifiable throughout the evening. The audience will be able to recognise the Butcher, Baker, Candlestick Maker, et al, as they set up their scenes, adopt roles within their particular plays and give support to each play in the cycle. The plays grew out of a particular community, a community which, like our own, was in a process of change. The plays were seen as an opportunity for working people to challenge, as well as celebrate, the pervading culture of their time. The challenge for the 2008 company is give the plays a resonance and meaning which will make connections for a contemporary audience. It is my intention to base the interpretation upon the kinds of principles that one can assume were at the heart of the original productions. • An opportunity to raise questions and challenges within the performance of a powerful story. There will be a presentation of each play in this production; some will be concise, others performed in their entirety. I want the audience to have a sense of the magnitude of the events being depicted, whilst at the same time creating a brisk and energetic production. The music is to be an integral dimension of the production. It will be based upon Lincolnshire Folk Song, with the musicians clearly visible and often taking part in the dramatic action. Although a lot of the music is being prepared , in terms of composing, adapting and scoring, there will be much that is improvisational and created as a response within the rehearsal process. Liam Robinson is to be The Musical Director, with Frank Kelly, Lesley Clark and Tim Walker already committed to taking part in the production. The interpretation will be supported by the design of the lighting, music, sound, setting, costumes and props. Texture, colour, shape and material will reflect both the genre of each play, as well as the fictitious Craft-Guild that has been selected to perform it. David Dray has already begun work on the staging and Lighting and Jess Farmer and Laura Hill intend to have the design work completed by Christmas. Bakers, Brewers, Stone Masons, Weavers, Cloth makers, Dyers, Apothecaries, Cobblers, Blacksmiths, Potters, Millers, Goldsmiths, Wheelwrights, Gardeners, Carpenters, Merchants, Candle Makers and Sowers. A further aim is to create a large scale ensemble company, with the cast involved in changing the settings and scenes, in their roles as local craft folk. This will, I hope, facilitate a sense of involvement and ownership amongst everyone involved. The evening of each performance will begin with a Medieval Fayre, outside The Cathedral and Minster. This will involve people making things, eating, drinking, juggling, entertaining, etc. The band will then strike up, the audience will be gathered together, they will be led into the performance area and………..The 2008 production will begin! 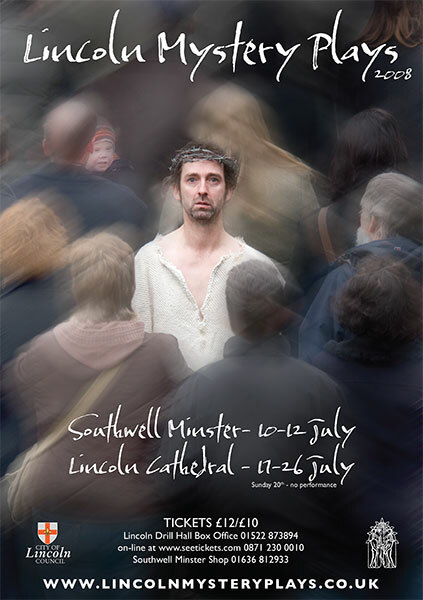 CELEBRATING the 30th year of the rebirth of the mystery plays in Lincoln, this year’s production has taken the plays back to the medieval origins of various craft guilds presenting a different biblical story. For those not experienced with viewing mystery plays, such as myself, the long list of individual plays found in the programme could be off-putting, but the wonderful delivery in the beautiful setting of Lincoln Cathedral cloisters meant time passed un-noticed. The contemporary music, under the direction of Liam Robinson, brought an added dimension, helping the audience truly believe they had stepped back in time. Every member of the large cast worked together to deliver the true spirit of the plays, presenting stories from the Bible to the community, and the chiming of the cathedral clock, interspersed with contributions from the resident falcons added to the astounding atmosphere. The satannical triumvitrate of Aggi Gunstone, Jo Hollingworth and Janet Smith stole the show, reinforcing the notion that the devil obtains all the best tunes. It was a directional stroke of inspiration to have three actors simultaneously playing Lucifer, an antithesis to the trinity of Father, Son and Holy Ghost. Herod played by Rasen Mail editor Jason Hippisley was regarded as ‘not half bad’ either! It was also a somewhat controversial break with tradition to have God played by a woman, but Ruth Andrews rose to the challenge and was the perfect balance to the ‘evil’ of the plays. Jesus, played by Kevin Troughton, seemed genuinely world weary and we truly believed he carried the sins of the world upon his shoulders. The Crucifixion was executed brilliantly and, with daylight fading, the effective lighting and intense acting brought the scene to a dramatic climax. Both actresses playing Mary convinced us that she was the mother of God. Josie Bruce, the young Mary, in a beautifully enacted birth scene, exuded true happiness and the older Mary present at the death of her son, portrayed by Ba Wheeler, showed great emotional depth. Looking around the audience, I wasn’t the only one to reach for the tissues as Mary cradled her dead son. Aspects of the plays will live with me for a long time. Director Geoff Readman, and indeed everyone involved in the plays, must be congratulated in bringing a truly awe-inspiring production together.